For those of you with a sweet tooth, dinner never ends with a main course, because hey, there’s always room for dessert. 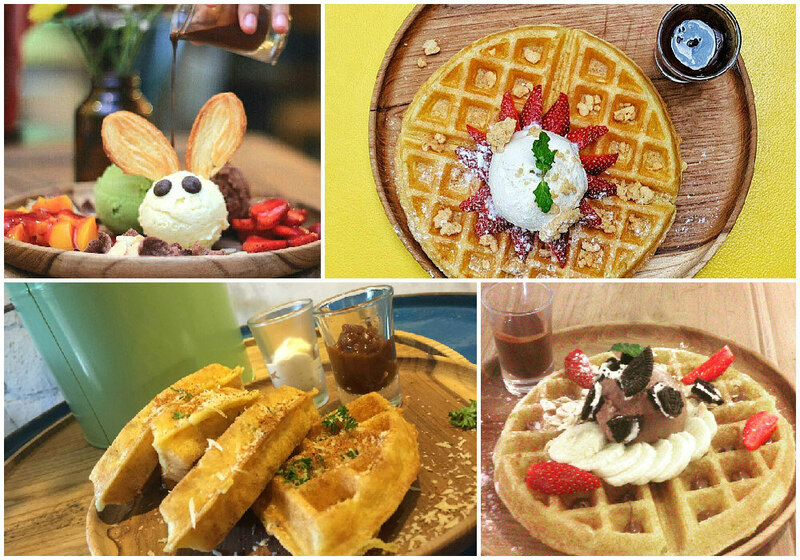 Bandung may be crowded with all these awesome cafes or themed restaurants that make you entirely spoilt for choice, but it’s not everywhere that you can find delicious dessert, especially those that look too pretty to be eaten! 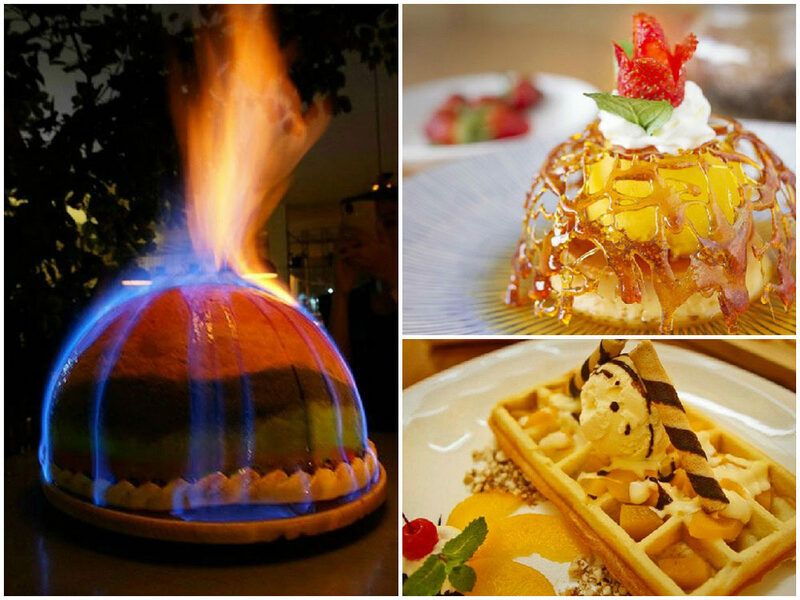 We’ve here 12 dessert places where you can find Instagram-worthy dessert. 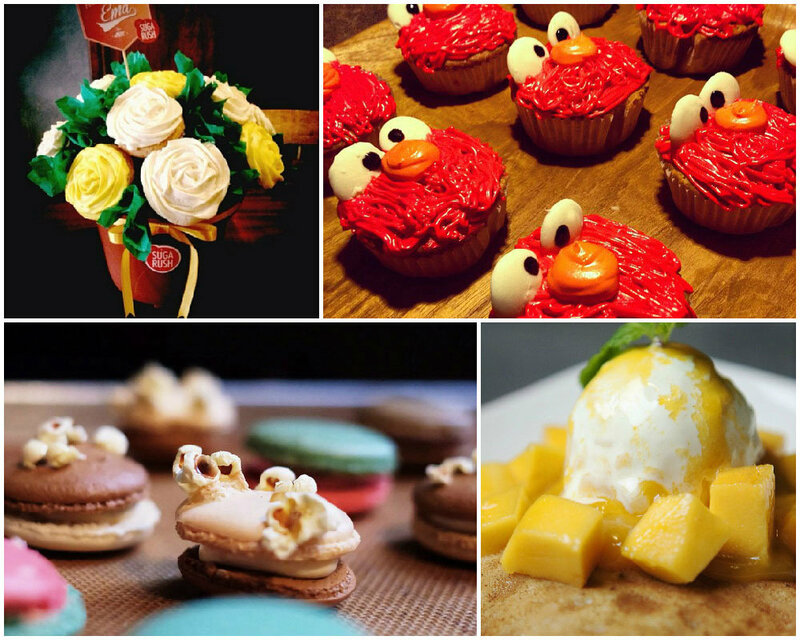 With so much eye candy, you’ll never look at sweets the same way again. Who says you can’t oogle at your dessert and eat it too? Located in Jl. 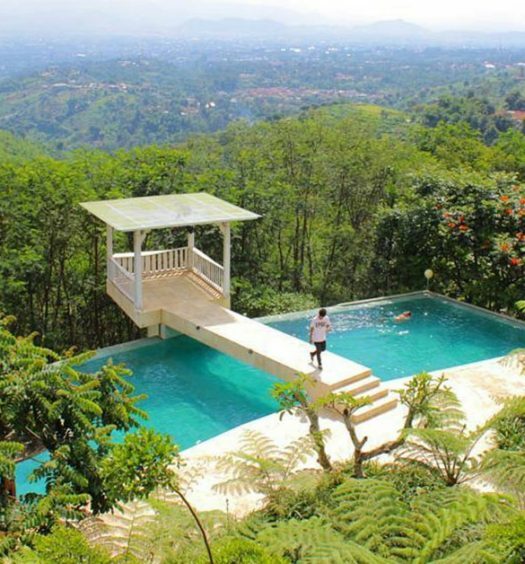 Dago, Verde is one of the most popular places to hang out at in Bandung. 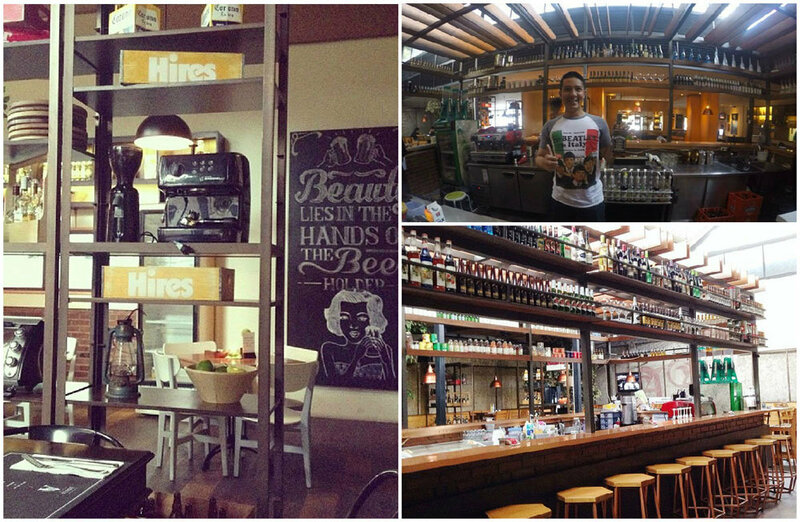 It’s both a restaurant and a bar, and you can also get your afternoon tea. Verde is also well-known for its dessert. Have you ever seen something like this before? A rainbow coloured volcano pizza – their signature dish, where the flames will be light up before you eat. And take a look at this one, the Cream Caramel. You wonder, where can you start your first bite? Anywhere is good, and once you have reached the inside, you’ll love it even more. Check out this video of the burning volcano pizza too! 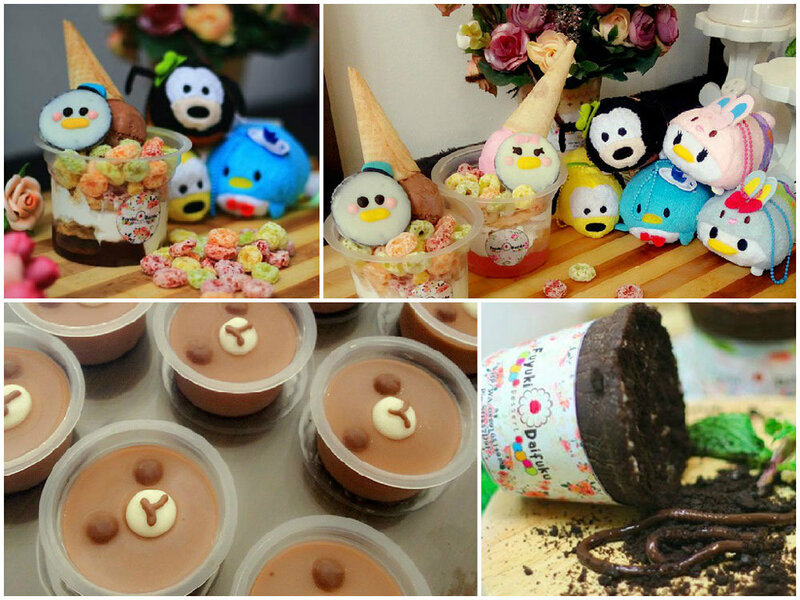 At The Dream’s Cake, you will find all the yummy desserts that you can ever dream of. Try this Taiyaki ice-cream, you don’t just get the traditional red bean flavour, but also red velvet! And to top it all, you’ll get Fruit Loops cereal on yours too. 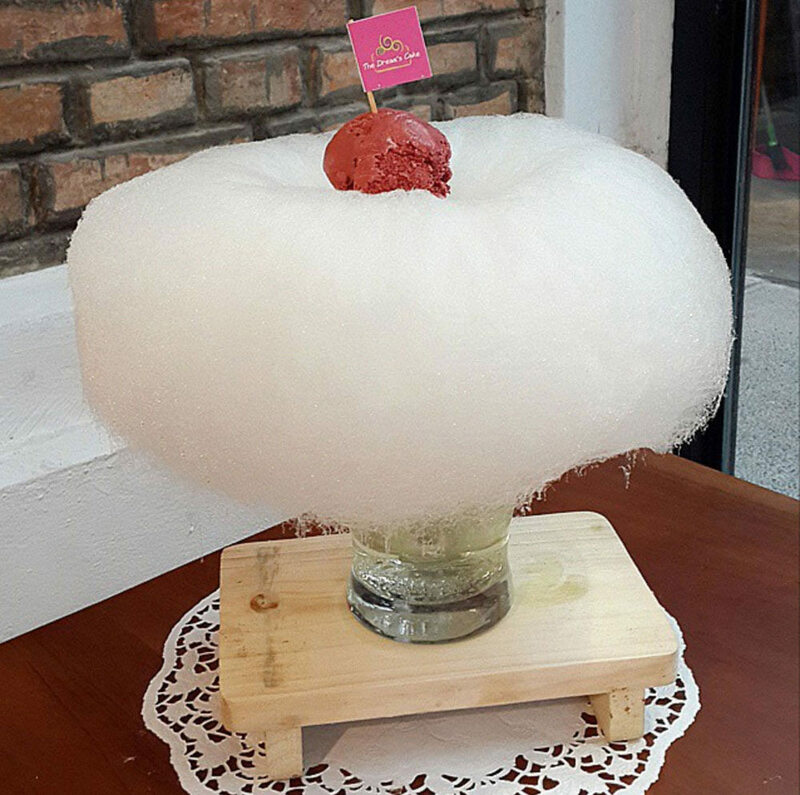 Don’t miss the cotton candy Dessert Tower – it’s a heavenly cloud that melts in your mouth. This patisserie is also known for its Cake in a Jar (yes you get your cakes served in a jar – red velvet cake, black forest, rainbow cake, and many others). You can also order it as a hamper to be sent to your loved ones. What a delight it would be as a delicious gift! On The Dreams Cake’s special menu is I Mochi You, a dessert served in a coconut shell with flavoured mochi, ice-cream and toppings. So it’s chewy and sweet and of course, very camera-worthy too. 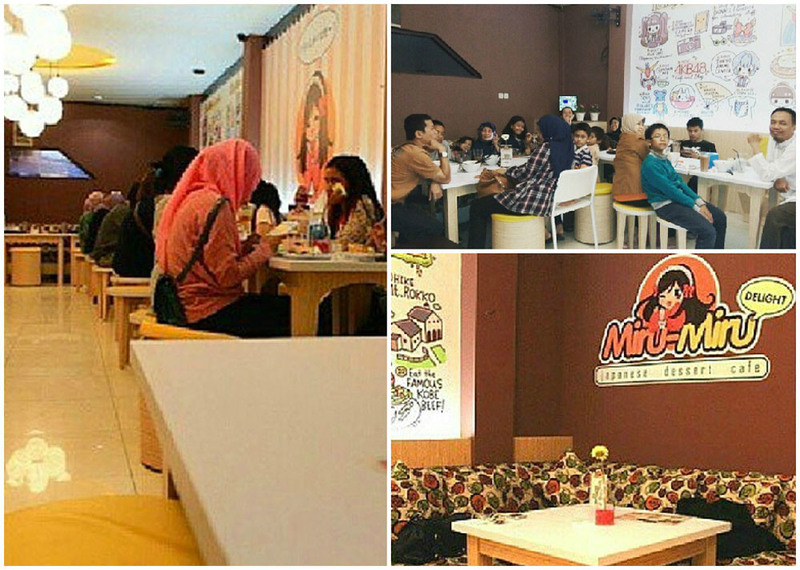 Fans of Japanese manga and anime will instantly fall in love with Miru-Miru Delight when you step into the stop. 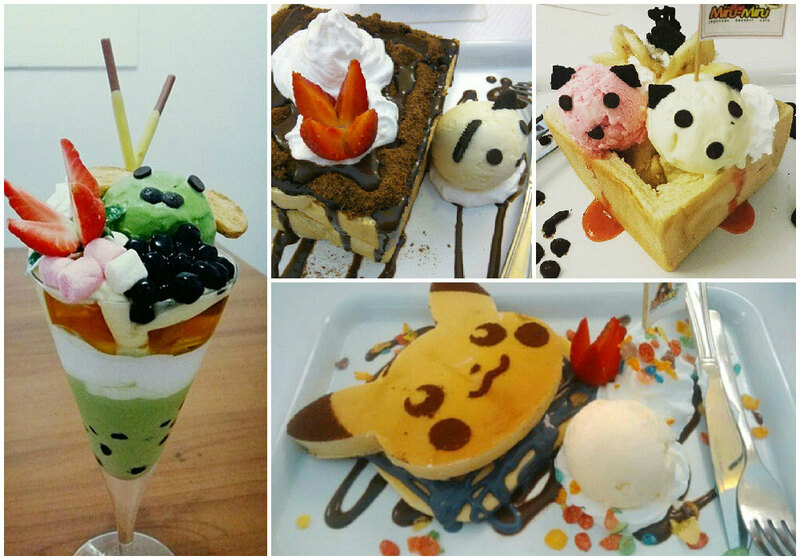 Not only are there anime and manga characters pasted all over their wall, but the desserts are comics come alive (or rather, 3D, and in the shape of your food). First, you’ve got to try I Choose You, Pikachu-shaped pancakes with whipped cream and ice-cream. Too cute to be eaten? Wait till you put the first bite in your mouth. You already love the shape, and will love the taste even more. If you’re a fan of banana, you can order Banana Kitty Box, which comes with two scoops of ice-cream in a toast with a cute kitty shape. For now, Fuyuki only serves takeaway desserts, but you’ll be utterly delighted by what’s available. Look at this Chocopot. No it’s not a worm, it’s part of the dessert and of course it’s edible. You can bring this pot home and watch your family’s reactions. One of the main highlights of Fuyuki Daifuku is its Delight Tsum Tsum Parfait, inspired by Disney’s Tsum Tsum baby characters. Once you see it, you’ll know you want it. Do you remember when you’re a kid, you used judge a food by its appearance? The cuter it looks, the more you want to try it. That’s what happens if you are at Sweet Belly. Check out Mr. Cheesy if you’re a fan of cheese and sweet stuff – it’s one of the favourites here. If you’re going there with kids, make sure they try this one. 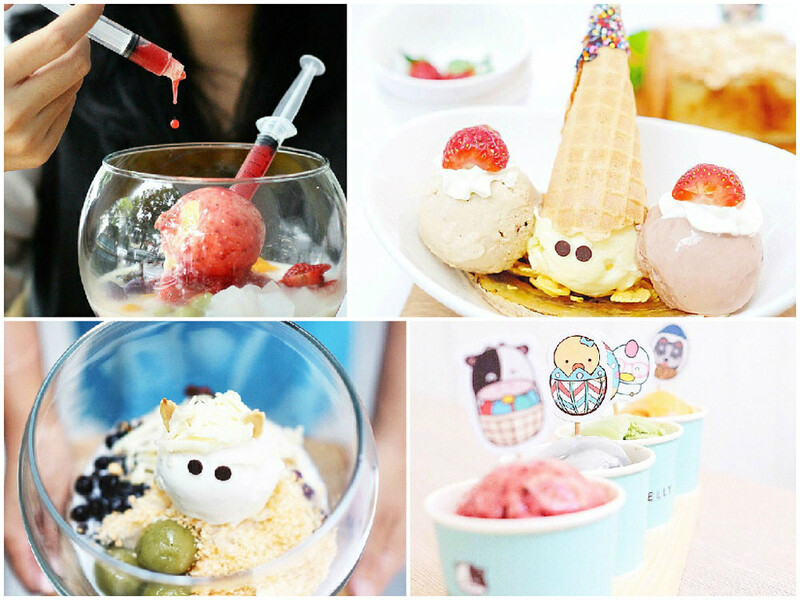 Who can resist cute dessert? 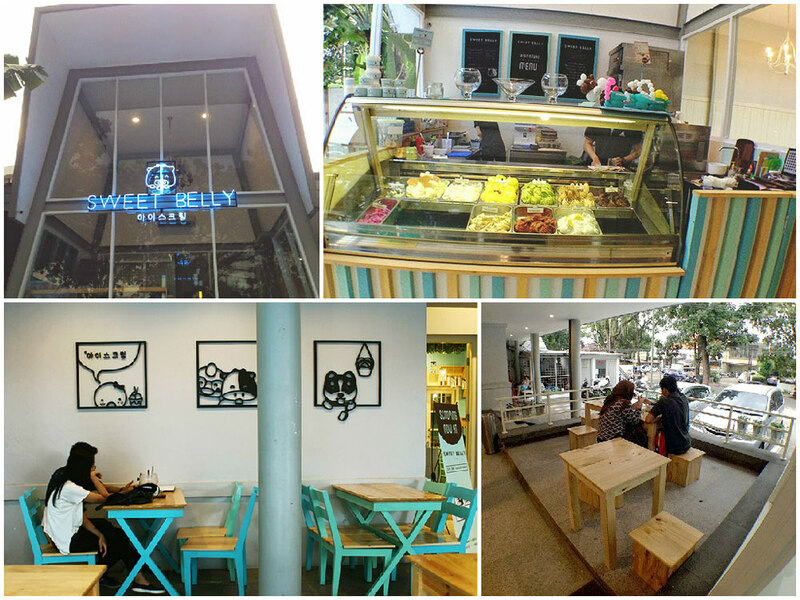 And if you’re into Gelato, we strongly recommend you to try Sweet Belly’s Gelato. If you want to taste all the different flavours, you can order the Gelato Sampler. Next up, check out the Bingsoo! Bingsoo is Korean dessert with shaved ice with some toppings. Try the Berry Patbingsoo. What is more fun than injecting your ice-cream with berry sauce? 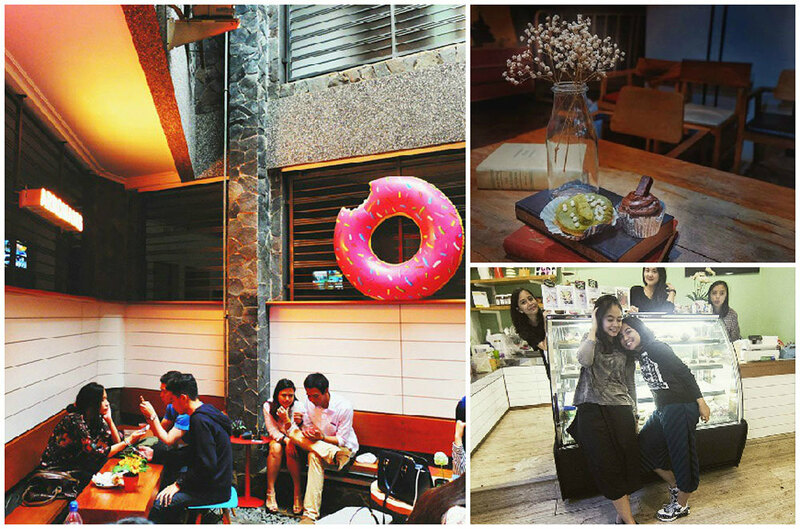 Rabbit Hole is located in the same place as Miss Bee Providore, an interesting family friendly cafe in Bandung. 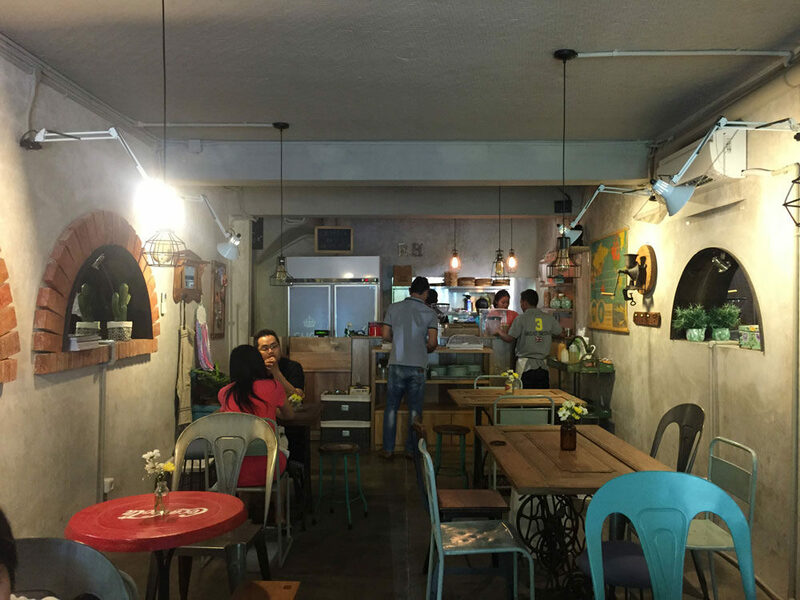 The small shop occupy Miss Bee Providore’s garage, which is now transformed into a cute place to have dessert. The first thing you have to try at Rabbit Hole is the Banana Split. 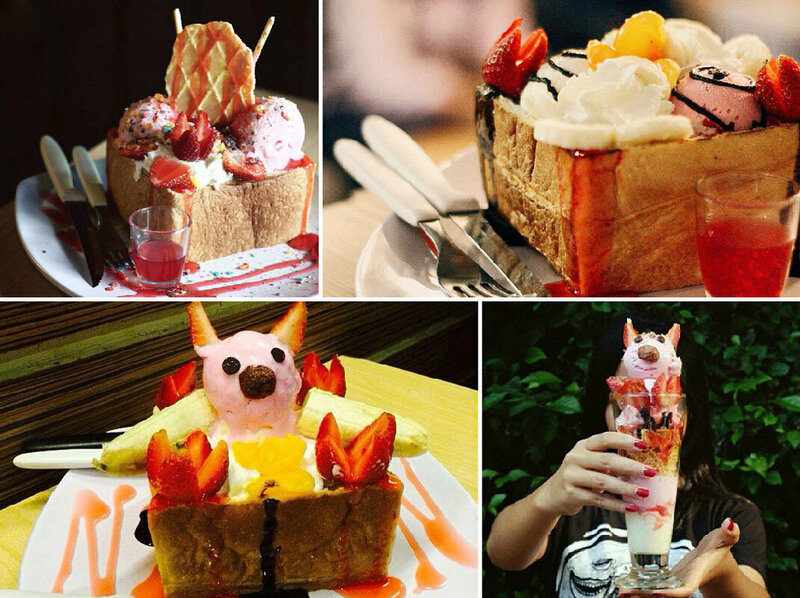 No, this is definitely not your typical Banana Split, it comes with a rabbit face that definitely make you melt. On it you will find two scoops of ice-cream, two genji pies as the rabbit’s ears, fresh strawberry, peach, and Koko Crunch cereal, served on a wooden plate. If this doesn’t put a smile on your face and tempt you to post several photos on Instagram, we don’t know what else will. You may also want to try the Nutella Waffle – served with fresh strawberry, banana and ice-cream. You can spread the thick yummy chocolatey Nutella all over the waffle – a favourite for any child if you’re bringing the little ones. The Nutella and fresh fruit combination will make you crave for more. The Blueberry Cheesecake Waffle is also worth to try. And this is not cheese spread over the waffle – you will actually find pieces of cheese inside the waffle itself – pretty innovative! Rabbit Hole serves savory waffles too, such as Mac & Cheese waffle – your classic childhood pasta with a cute twist. The mac and cheese is inside the waffle, which is topped with spicy powder. 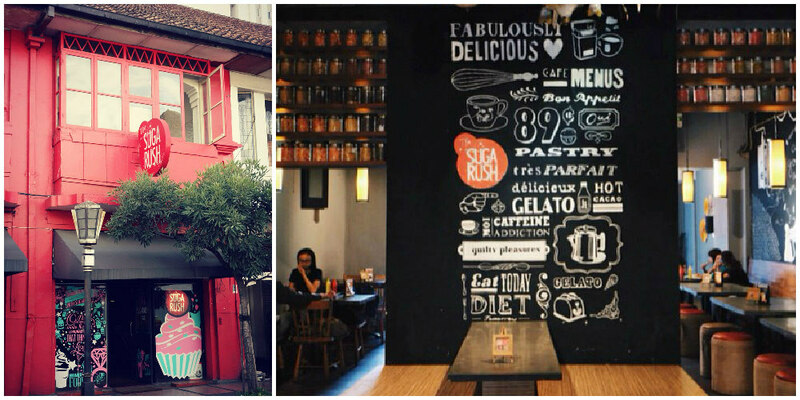 Located in Jalan Braga, one of the iconic areas in Bandung where you’re surrounded by colonial buildings, The Sugarush is easy to spot. Among the other white shophouses, The Sugarush is splashed in an eye-catching red – sure to tempt you to take a second look, just like its desserts. 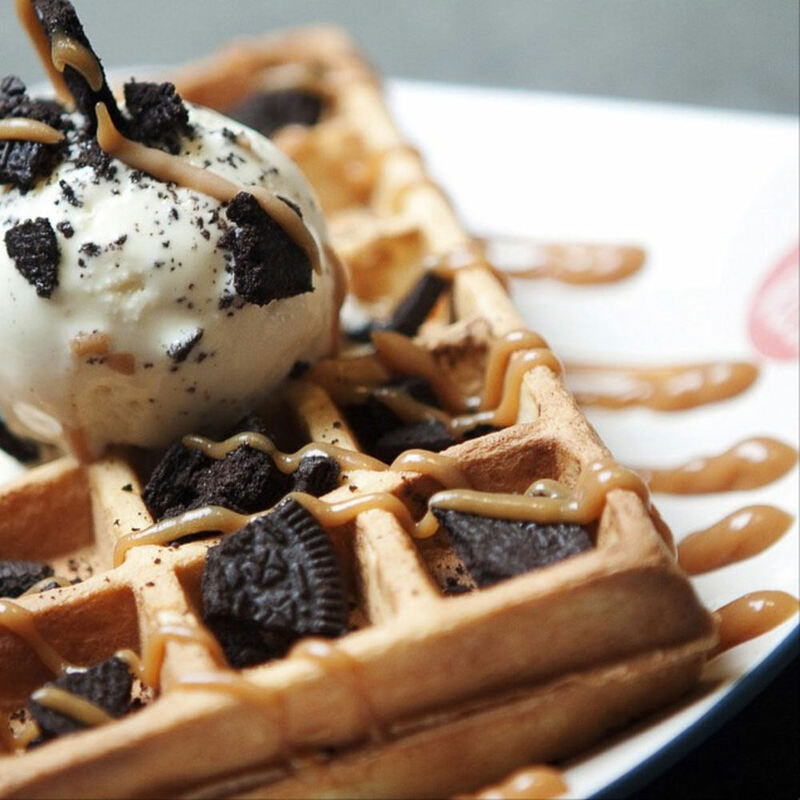 Our recommendation is Black Crumble – you can get your choice of waffles or pancakes, served with ice-cream and Oreo bites. 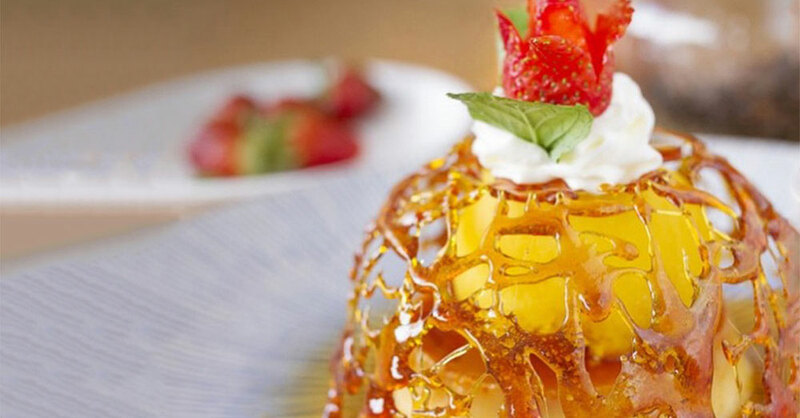 This dessert not only looks super yummy but is actually really delicious, with ice-cream that melts on the waffle and creates a perfect taste when you savour it. Sugarush is also well known for its Macarons. These sweet little colourful Macarons will make you think twice before you eat because they’re oh-so-pretty but once you’ve tasted them, you’ll ask for more. And that’s not all. Combining crepes with fresh fruit is always a good idea – don’t miss Sugarush’s Crepes + ice-cream + Mango – it’s so good! And if you hear your kids squealing in delight, you’ll know they’ve spotted the Elmo cupcakes. Seriously. Look, how much cuter can cupcakes get? 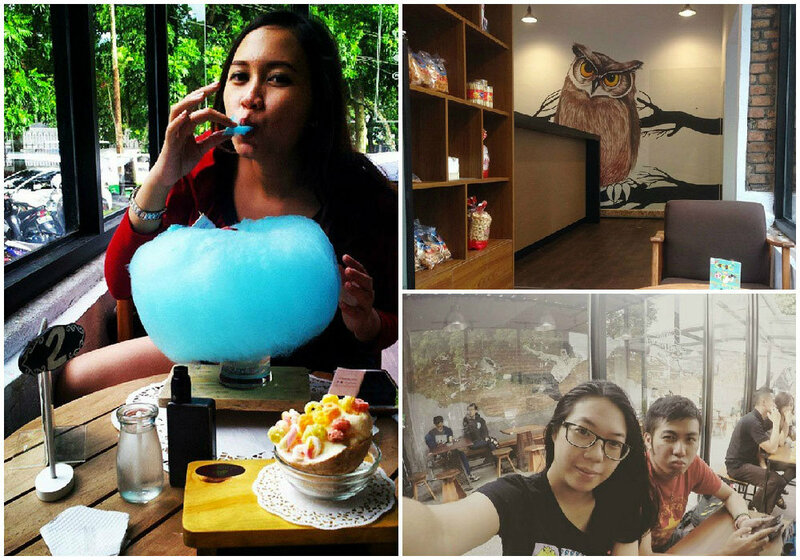 Rits ice-cream is pretty much considered a hidden gem in Bandung. You can’t exactly find many reviews of it, and you don’t hear people talking much about it. But Rits is truly the perfect place to enjoy some of the best ice-cream. 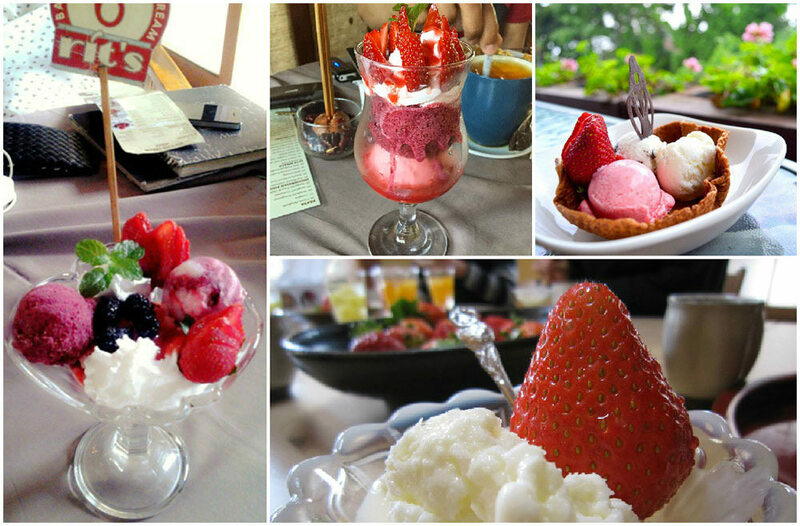 If you are an old-fashioned ice-cream lover, the Strawberry, Vanilla, Chocolate ice-cream will satisfy your appetite. And if you’re into something new, try the Lengkeng Yoghurt, Choco Mint, Caramel Butter, Cookies & Cream flavours and many more! We recommend the Tropical Joy – 2 scoops of ice-cream with whipped cream and fresh strawberry on top – Rits’ all time favorite. 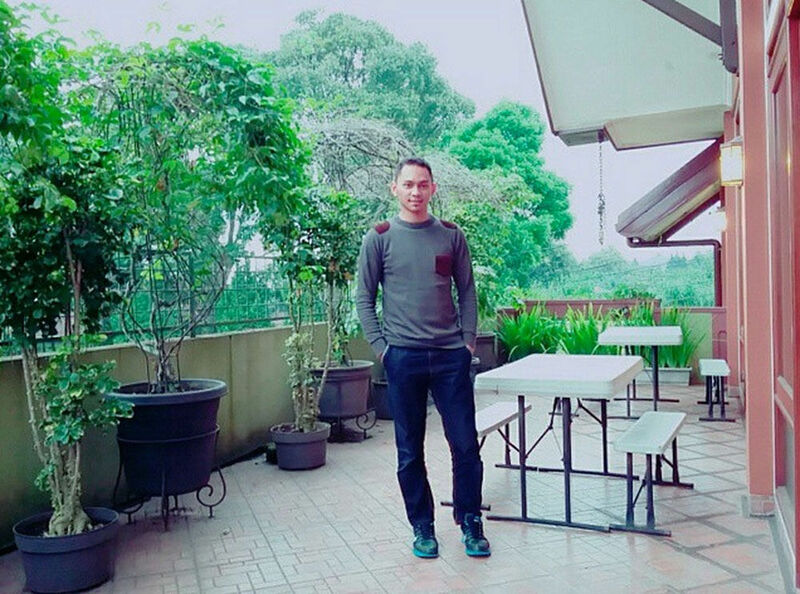 Located in the north, Rits is very homey, and you can enjoy the view of Bandung from the second floor. 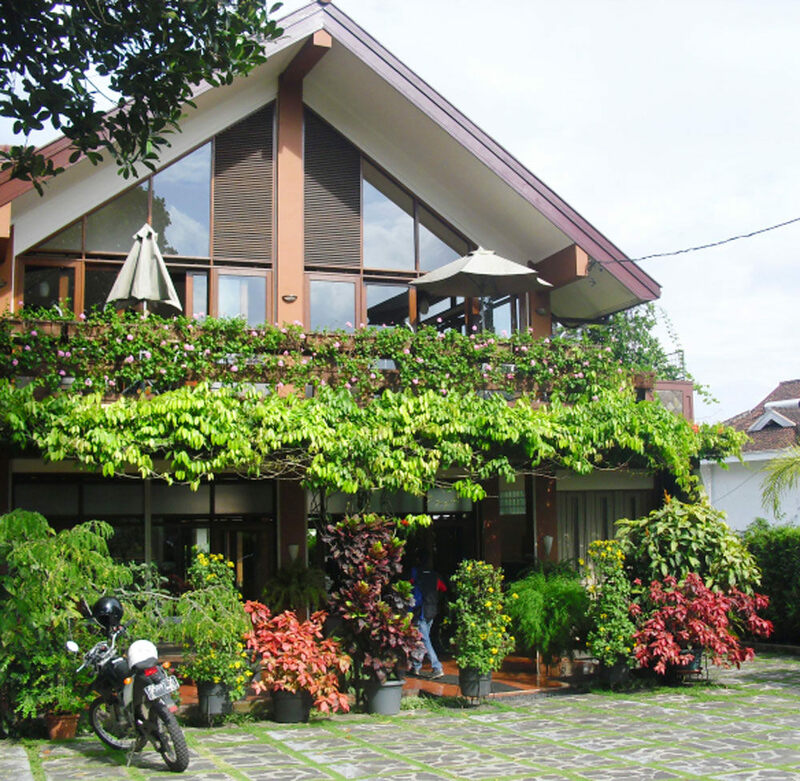 And if you love flora, you will definitely love this place – the shop is nestled in the midst of plants and flowers. In fact, the cafe used to be a residential house, so you will feel like you’re dining in someone’s dining room. 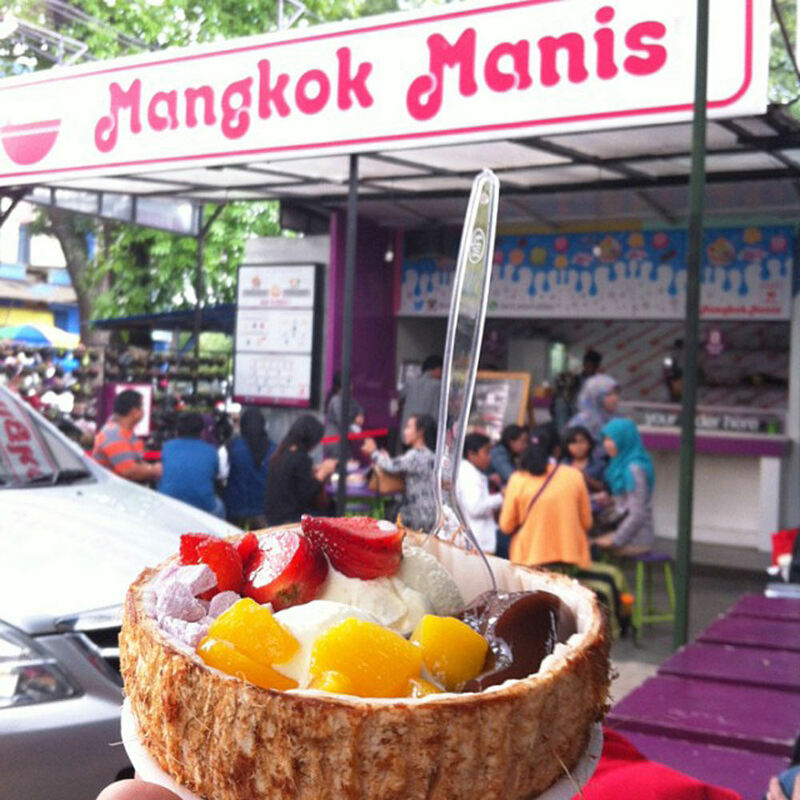 Mangkok Manis means “sweet bowl” in Bahasa Indonesia. Because here, your dessert is served in a coconut shell. And the best part is, you can choose what you want inside. 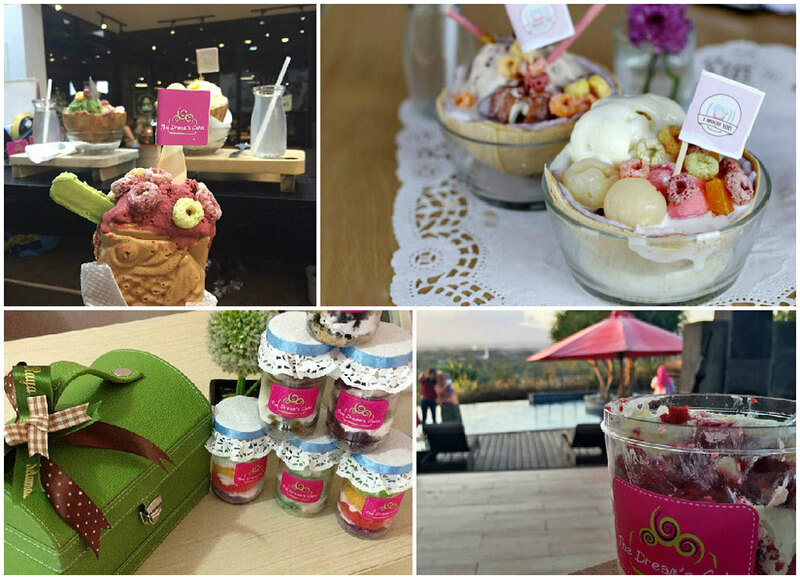 Let’s start with ice-cream – there’s various flavours such as Vanilla, Strawberry, Rum & Raisin and Green Tea (yuums!). 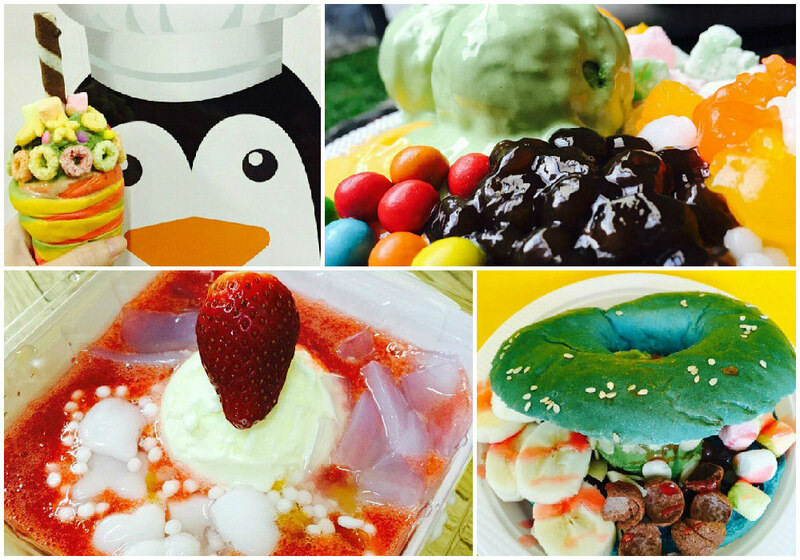 On top of ice-cream, your dessert will be served with pudding too, and you can choose from the flavours Vanilla, Mango, Black Forest and many more. Lastly, it’s time to pick the toppings! From Kit Kat, Choco Chips, Oreo, Stroopwafel to fresh fruit (Kiwi, Peach, Strawberry, Lychee, and Longan), you’ll literally be dazzled by the variety of choices. 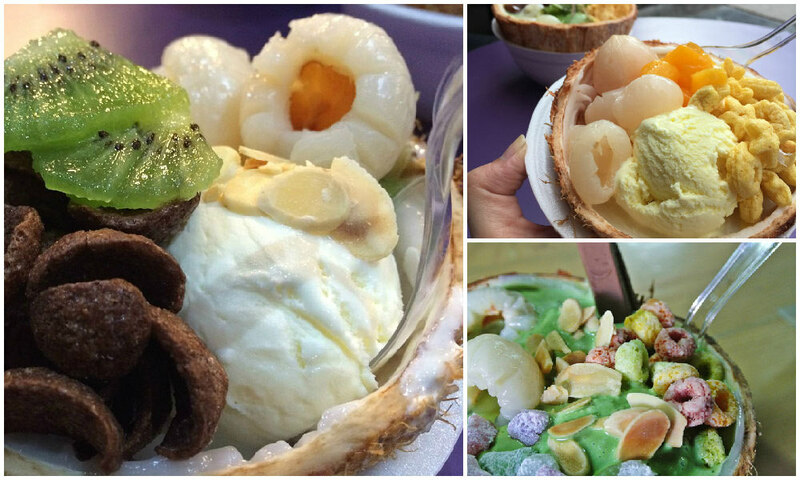 If you prefer your dessert in a real bowl instead of a coconut shell, you may choose the other menu, which features equally heavenly sweets such as Mango Bliss, Mr Red Bean, Mr Duren (durian), or Mango Mochi. Be prepared to queue a bit, but don’t worry, you don’t have to wait for a long time to get your ‘Mangkok Manis’ fix, as the staff usually would serve you pretty fast. And after all, the dessert is worth the wait. Toast with bacon and egg is for breakfast. For dessert, it’s toast with ice-cream! That’s the after-meal treat you can indulge in at Toast Cream, a small shop located in Jalan Teuku Umar, near Jalan Dago (a popular area in Bandung for dining and hanging out). The shop is so small, it’s also called A Box of Happiness. 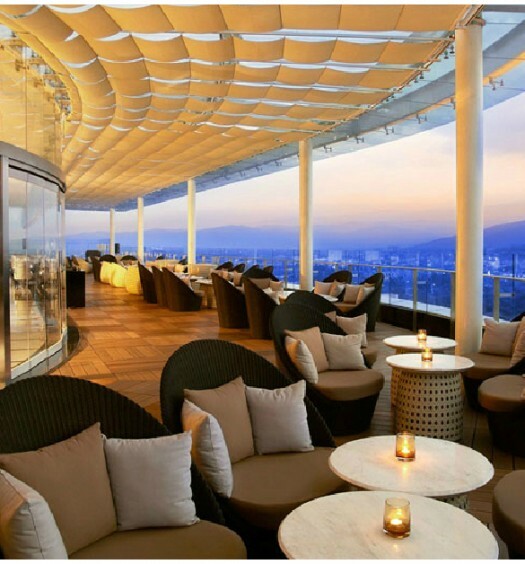 As one of the most happening places in Bandung, don’t be surprised if you have to wait for a table. But don’t worry, it’ll all be worth it when you lay your eyes on your deliciously pretty dessert. Toast, topped with ice-cream and an assortment of toppings. You even get a few pieces of toast inside it so it can actually be a meal! You can also try the Marshmallow Toast, on which you can also add ice-cream and selected toppings. 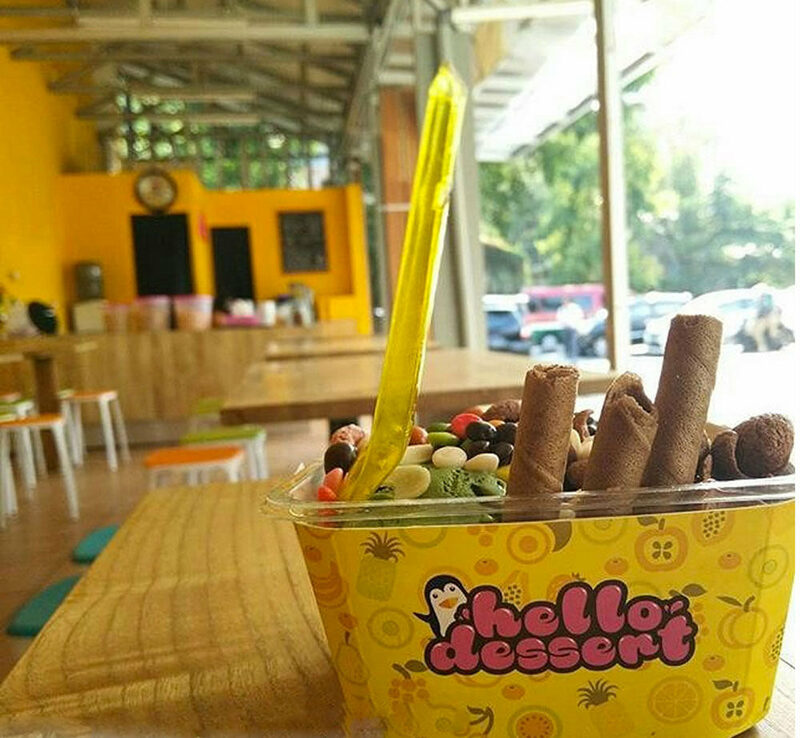 Hello Dessert is a new gem in Bandung and has instantly become dessert lovers’ favorite. 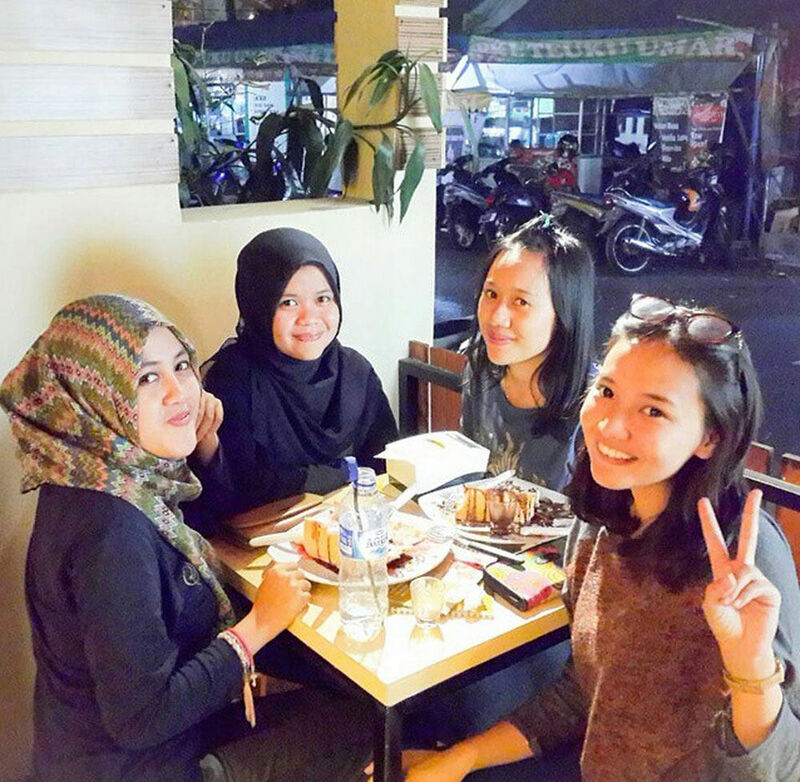 Located in Jalan Burangrang, Hello Dessert serves desserts that are not just good-looking, but taste great too. Try the Strawberry Float – it’s strawberry yoghurt with ice-cream and selected toppings – great for refreshing yourself in on a hot afternoon. If you love doughnut and ice-cream too, you need to taste this Doughnut ice-cream! And you know green tea ice-cream goes with anything. Try the pudding and add some toppings to go. As for classic ice-cream lovers, if you’re bored with an ordinary cone, Hello Dessert has a colourful Bread Cone ice-cream – yummy ice-cream and equally tasty bread. Forget about the ordinary cone. Arromanis sells creative cones you will love, such as those with fruit loops around the cone and marshmallows on ice-cream. If you’re here with a bigger group, or simply want more for dessert, you have to try the Dessert Plate, which consists of bubble gum softies, Nutella cake in a cup, and Matcha Whoopie. Perfect combination for a perfect dessert. And cupcakes are never out of date. 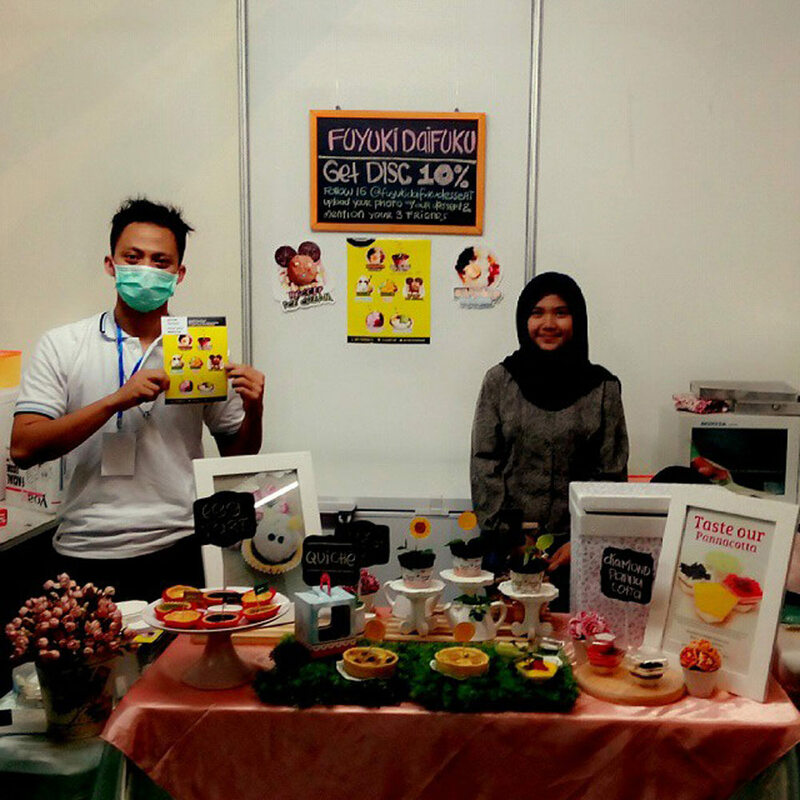 Here, you can find various kinds of cupcakes, ranging from Red Velvet Snickers, Banana Fruity Pebbles, Pocky Strawberry, Kit Kat Ovomaltine, Kit Kat Macha, to Choco Banana. 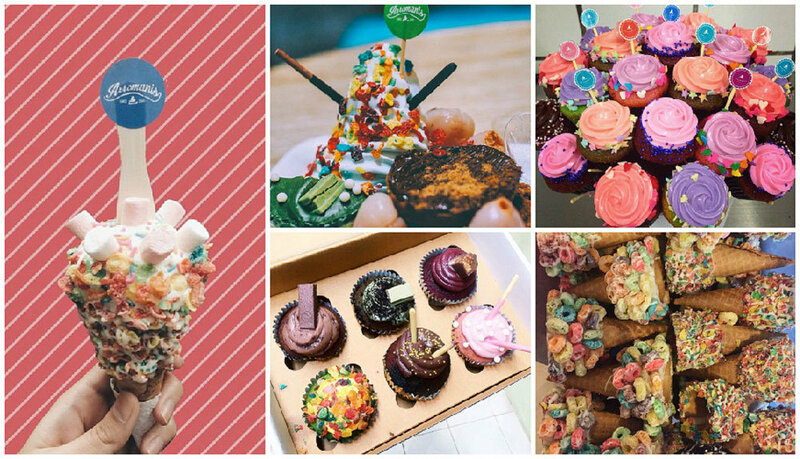 Not your ordinary cupcake flavours, right? And if you’ve always wanted to surprise your loved one with flowers and something sweet, you can take a look at the flower bouquet-shaped cupcakes! You will be loved even more. Are there any more pretty patisseries you know that sell dessert fit for your camera? Let us know, or even better, show us the delicious pictures!